Our Google search for “flowers, columbus, ohio” returned a couple of sponsored links from what appear to be local florists. What might not be clear is that the owner of that website is in Michigan. The company is what is known in the floral industry as an “order gatherer,” or sometimes derided as a “deceptive order gatherer,” or DOG, as described in a recent story in the Philadelphia Inquirer. An order gatherer will entice you with deals that look great but, upon closer inspection, probably aren’t. 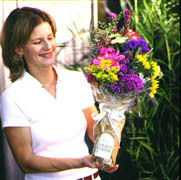 In almost all cases, order gatherers present their flowers at discounted prices. A tulip bouquet valued at $81.99 is shown as marked down to $44.99, for instance. They also tend to upsell, so that when you select a standard or regular arrangement it defaults to a “deluxe” (read: more expensive) version. Flowers are a time-honored way of letting mom know just how much you love her. But sending flowers long distance can be confusing and sometimes disappointing, especially if you are not familiar with the process and some of the pitfalls. The Internet has given rise to thousands of flower-delivery options. But how do you know you’re really getting a good price and high-quality service? And will the flowers arrive on time? Many websites touting great prices show you a gorgeous arrangement – only to deliver a bunch of flowers in a box that mom still has to put in a vase. In many cases, what is delivered is similar to what you’ll find in a grocery store or at a street vendor. It might be a nice bouquet but not arranged in a container; often, the container costs extra. After adding extra charges such as service and delivery fees, the great price that first got your attention might not be any better than what a local florist would charge. Perhaps you know of a florist where mom lives. But be careful if you use a search engine to find contact information for that florist. Many unscrupulous companies make themselves appear to be local florists – maybe the one that you’re familiar with – by using a similar name or even a local phone number (that ultimately rings to another state). These companies tend to charge high service and delivery fees, only to hand off the delivery to someone else. They charge you fees that they didn’t earn, and you don’t get what you paid for. You can avoid these hassles and ensure the best results by placing your order early – and by calling us when you do. We’re proud to be your local florist, but we also are one of the largest senders of long-distance orders in the country. Other florists want to keep us happy because they want to continue receiving our business. We also foster our relationships with them through our regular participation in national florist meetings. In short, we can resolve the rare problem when it occurs. What’s more, we have strong ties to FTD and Teleflora, the two largest wire services that florists use to transmit their orders, and they will step in if necessary to make sure that problems are addressed to our customers’ satisfaction. Sending flowers long distance can be confusing, but it doesn’t have to be. Just call us, and we’ll make the process easy. We’ll handle your out-of-town order with the same care and attention it would receive if we were delivering it ourselves.